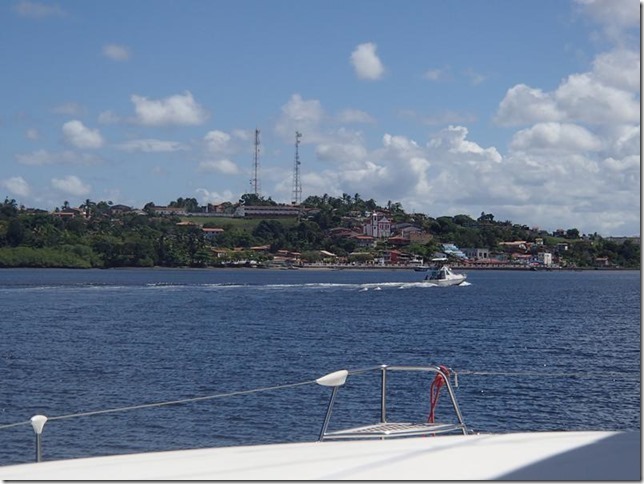 For the past three days we have been cruising in the bay of Camamu. 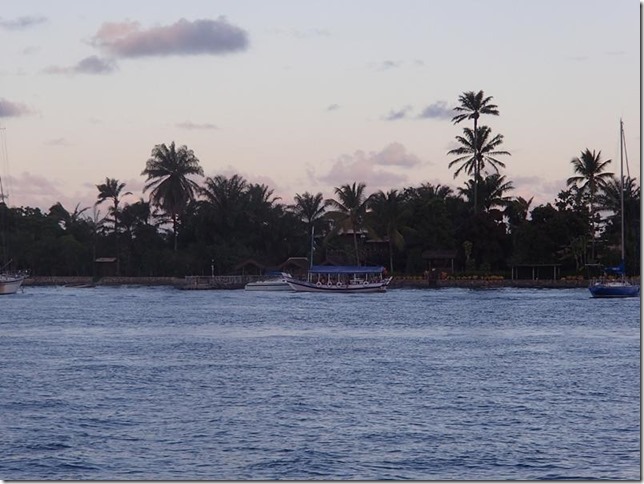 The first couple of nights we spent anchored off Campinho, an island between the Marau river and the ocean. The third night we spent anchored off the town of Marau, in preparation for a trip up the river to the Tremenbe waterfalls. 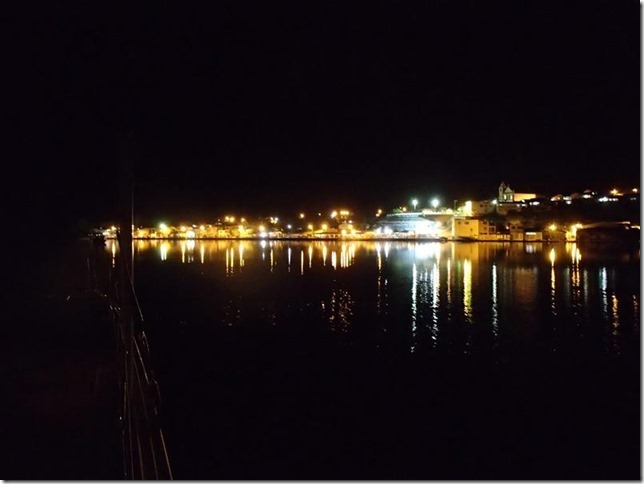 Marau by day and by night. 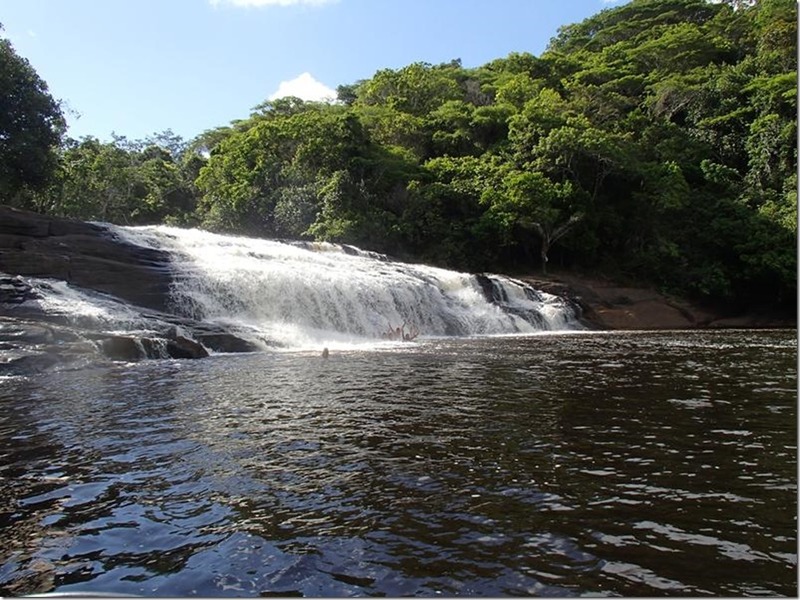 This morning we set off up the river to the waterfall, armed with a diagram of the river from our Brazil cruising guide. Not so much of a chart as a rough sketch. We left Mr Blues anchored off Marau and both crews travelled on Anastasia, because our draft is only 1.3 metres with the dagger boards raised. We were towing Mr Blues’ dinghy for the final part of the trip to the waterfall. We set off at the bottom of low tide so that there would not be a strong current against us. This also had the advantage that we could see most of the rocks and sandbanks poking above the surface, but it meant that we were in rather shallow water, sometimes with just a metre under the hull. We got about two thirds of the way before we hit the sandbank. Fortunately it was quite a gentle collision because I had already realized we had lost the main channel and we were zig-zagging slowly to try and find the channel again when we hit the bottom. One of the problems of being 8 metres wide is that the depth gauge on the starboard hull can have a very different reading from the depth of water at the port hull. Having run aground, the main issue was that the propellers were already up onto the sand so we could not just reverse off. It was now a couple of hours after low water so there was some current pushing us up the river and further onto the sandbank. Willy took Mr Blues' tender to take the bow anchor around behind us, which should spin us round and hold us off the sandbank as the tide rose, but by the time he had the anchor onboard the tender Anastasia had already floated off the sandbank and into deeper water. The water must just have just been a few centimetres too shallow for us. Anyway, that was as far up the river as Anastasia went. We back-tracked down the river a few hundred metres, anchored her and went up to the waterfall from there by tender. It was a beautiful waterfall, well worth the visit and now we are safely back at the anchorage by Marau. The crews of Anastasia and Mr Blues waving from the foot of the waterfall.